A refreshing shower, any time of the day, is soothing and relaxing! The ‘nicety’ increases double-fold if your master bathroom is aesthetically designed with functional shower glass doors that prevent water splashes on your bathroom floor and gives you the privacy you need. In this internet era, with easy access to information and everything just a click away, we are all spoiled. We are at a loss when it comes to deciding which shower glass door is the best fit for our master bathroom, whether we should go for shower glass doors or a shower curtain, etc. There is a sea of places in the market selling shower glass doors of varying sizes, styles, designs, fits, prices and functionality. Selecting the one that fits your needs and your budget is mind-boggling. We, at Tashman’s, your local hardware store, are here to help you out. Read on! Space – A lot depends on how much space you have and what the layout of your master bathroom is to ensure that your shower glass door opens up and functions properly. If you have less space, but are still looking for a wider opening, you can go for a sliding door, folding or bi-fold door. For pivoting/swinging/hinge doors, you need enough clearance between the fully opened door and other bathroom fixtures, before installation. Look – For a modern, contemporary look, go for frameless doors. These function without the support of metal around the exterior edges, frameless doors look clean-lined, free of visual obstructions. Frameless shower glass doors are popular also because they help display the intricate tile designs, beautiful stonework, and gleaming hardware. Budget – There are a multitude of shower glass doors in the market, a lot depends on how much you are willing to spend for your master bathroom. Frameless shower glass doors, may enhance the beauty of your bathroom, but are expensive. 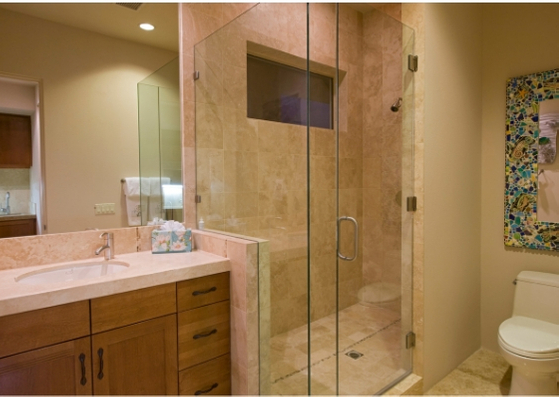 If they are beyond your budget, you can go for semi-frameless or framed shower glass doors. These also are eye-catching and sturdy! Privacy – Bathing behind a door always gives you more privacy and comfort. If you want more privacy, you can go for stained/textured shower glass doors. In addition to adding a bit more fun to your shower, they are easier to clean than clear glass shower doors. The type of door that will work best for your master bathroom shower depends on the design of your shower, the size of the opening and how far out you want to open the door. Tashman’s carries and installs a wide variety of shower glass doors that can be a perfect fit for your master bathroom. Available in standard and custom sizes, with and without accessories, in varied finishes and styles, the doors that we sell are amongst the best you can find in the market. Simply call us or fill a form to get an estimate of the pricing or visit our hardware store today!